The REDI-Dx® Biodosimetry Test System is being developed as an in vitro diagnostic test, which uses blood collected into DxCollect® Blood Collection Tubes (BCT) for the quantitative estimation of the absorbed ionizing radiation dose. Test results are intended to be analyzed with the ABI 3500xL Dx Genetic Analyzer and the REDI-Dx Interpretive Analysis Software. The intended use population is the general population (including pediatrics and geriatrics) between 24 hours and 7 days after suspected of having been exposed to ionizing radiation. It is not intended to quantify doses delivered because of radiation therapy or from long-term radiation exposure. Test results are for use in conjunction with clinical signs and symptoms, as well as radiation dispersal monitoring. The REDI-Dx Test System is intended for use within high-complexity molecular diagnostic laboratories. After collection using the DxCollect® Blood Collection Tube (BCT), the sample would be transported to testing labs at ambient temperature. The DxCollect® solution preserves the nucleic acids within blood allowing for ambient stability up to 14 days. 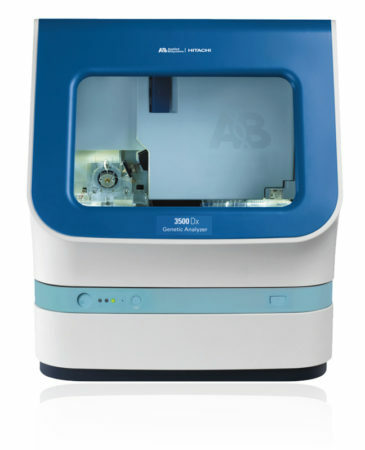 Upon delivery, the lab would use the REDI-Dx® Test with automated liquid handling platforms specifically being developed for high volume and high throughput to perform sample processing and testing, with a capacity for tens of thousands of samples per week, each system processing up to 650 samples in a 24-hour window. Final analysis would be performed on the ABI 3500 Dx Genetic Analyzer instrument, with results generated by REDI-Dx® Interpretive Software. REDI-Dx® system performance is being assessed using data consisting of total body irradiation (TBI) samples and non-irradiated samples which included different ethnicities, ages, and potentially confounding conditions including burn, trauma and flu. REDI-Dx® dose estimates are anticipated to be quantitative throughout the clinically relevant range of 0 to 8 Gray (Gy), and are being developed to rule out non-radiation exposed individuals with a 99.5% specificity across different ethnicities and potentially confounding conditions. Prioritization of individuals who have received between 2 to 6 Gy will improve utilization of limited resources to increase survival (D Weisdorf, et. al.). The REDI-Dx® High Throughput Biodosimetry Test System is being developed to have sufficient throughput, capacity, speed and accuracy to help formulate an appropriate response to a mass-scale nuclear incident. The REDI-Dx® Biodosimetry System is targeting a quantitative range of 0 to 8 Gy and a false positive rate of less than 0.5% across different ethnicities and confounding conditions. The system is being developed to be compatible with existing clinical laboratory testing infrastructure and to deliver results in as little as 6 hours.